For architects, businesses and shops and local authorities, public safety is paramount. Concerns for security in the public realm are growing due to the evolving threat of international terrorism, and while counter-terrorism requirements should be met in such a way that doesn’t compromise aesthetics, these principles and products can be used in everyday settings. Historically, safe spaces have relied on concrete, iron and barbed wire systems, however these can prove to be an unsightly blemish on an otherwise cleverly designed urban space. The key is to find that fine line between providing a duty of care towards the public, without compromising architectural creativity, and ensuring the chosen products don’t project an aura of fear. Most of the protective street furniture seen in today’s public spaces and streets is designed to protect our landscapes from the threat of vehicle-borne terrorism. But these products can also be used to protect people and businesses, prevent accidental damage and be used by local authorities. BSI PAS 68 is the most recent Publicly Available Specification for security barriers and is the industry’s benchmark for Hostile Vehicle Mitigation equipment. It specifies a performance classification for the barriers and their foundations when subjected to horizontal impact. There is a need for discreet integration of physical protection into our landscapes, and there are various ways this can be done without devaluing both surrounding architecture and existing infrastructure. 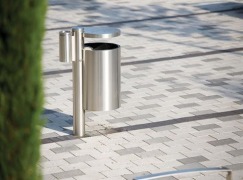 PAS-accredited protective technology can be integrated into large diameter bollards, but in instances where the installation of these would have a negative impact on an architectural space, consider innovative design-led solutions such as seating, litter bins, signage, lighting columns and even living walls. PAS 170While existing PAS standards are based on average vehicle speed within the UK (between 30mph and 50mph) and protective products impact tested accordingly, it doesn’t take into account roads and spaces with an average speed of less than 30mph. However, the government is on the verge of releasing the PAS 170 standard, said to be a low-speed test around 20mph. This new standard will cover the lower end of the protective street furniture market for items used to protect against the likes of ram-raiding and sharp bends on roads. Let’s take a closer look at integrated solutions with the key objectives of protective design to deter would-be intruders (whether from supermarkets, banks or any other targeted businesses), delay an intrusion to allow time for a response unit to attend, and prevent accidental collisions on the country’s roads.BOLLARDSThey’re a commonly used method to protect public spaces, shop fronts and accident blackspots, but bollards should be positioned as far as is possible from the vulnerable asset. If the barrier is required to be suitable for passing pedestrians – ie, outside a bank or protecting a school, for instance – the gaps between the structures should be no more than 1,200 mm to allow room for wheelchair users and prams. Bollards can be fitted with a RhinoGuard core and specifiers must decide upon – according to the bollards’ required function – what level of impact they must resist. For concerns regarding their appearance and aesthetics, there are a number of sleeve options available to ensure they coordinate with the landscape or an existing range. PLANTERSIn retail landscapes, instead of lining a walkway with the traditional bollard, a protective planter can be used instead to provide architects and local authorities with design-led yet functional alternatives for creating safer spaces outside businesses. The Giove Protective Planter makes for an eye-catching installation within the public realm and is designed to accommodate the root ball of a tree. These planters offer a pleasing aesthetic with landscape creativity and the level of protection required for shop fronts and public spaces, which are under constant threat of attack from ram-raids. SEATINGSeating is an integral part of the streetscape or public space, providing a meeting or socialising place, as well as playing an important role in contributing towards the character of that space. 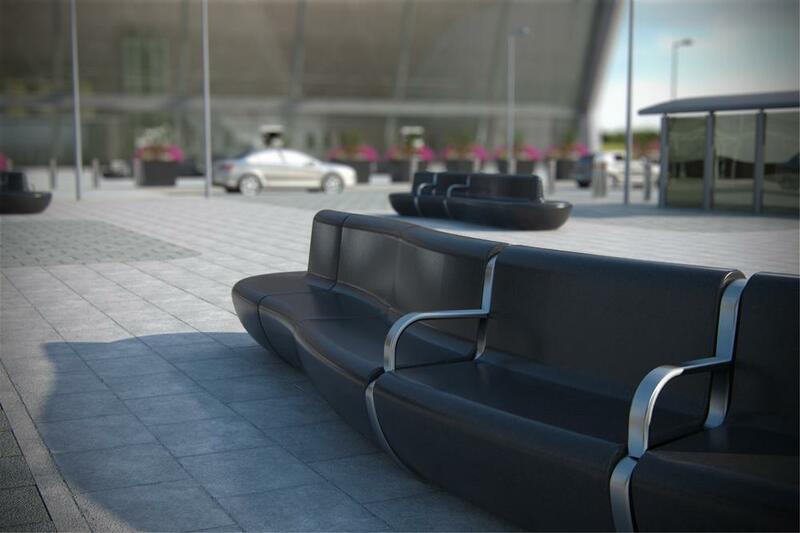 Throughout a wide variation of seating styles, an integrated security solution can be provided, with RhinoGuard technology fitting inside and able to co-ordinate with any environment. As a functional and more social alternative to bollard installation, a linear design of seating will provide the equivalent protection against ram-raiding of businesses, shops and ATMs. CO-ORDINATION IS KEYOur co-ordinated GEO range with integrated protective technology provides design-led street furniture to bring to life urban realm projects lacking in identity and minimise visual clutter. Contemporary design meets high-quality materials while public and infrastructure security remains the priority. The range comprises of a bollard, cycle stand, lightstack, fingerpost, litter bin, lamppost and a living wall, which combines natural landscaping to enhance the environment with the requirement to protect shops, businesses and public spaces in general. Products and designs that are chosen specifically to offer a level of protection to people, businesses and public spaces needn’t raise alarm or cause unnecessary worry. Instead, they can provide a stylish and innovative solution for potential targets of theft or spaces that are regularly the subject of accidental damage – and even add character to the space. But there is no ‘one size fits all’ solution – bespoke solutions are the answer, and we as designers and manufacturers have a duty to protect our clients’ spaces and businesses, as well as ensuring surrounding public spaces remain fully functioning.